This month leading sparkling wine brand, Freixenet, is joining the blossoming rosé renaissance and launching its first ever Italian Sparkling Rosé. With the Italian fizz having taken the nation by storm, Freixenet is tapping into the upcoming summer of rosé with a sophisticated and stylish tipple that is both beautiful and delicious. Landing on shelves just ahead of the warmer months, the fizz is perfect for wine lovers looking to upgrade their alfresco sipping with the ‘drink of the summer’. Between the striking bottle design and the shimmering soft millennial pink hue of the liquid, Freixenet’s Italian rosé is sure to become the most ‘Instagrammable’ tipple of the season. Presented in a show-stopping cut-glass bottle that looks just as enjoyable as it tastes, Freixenet Italian rosé makes for the ultimate celebratory fizz, perfect for upgrading any occasion. A beautiful blend of Italy’s finest Glera and Pinot Noir grapes, the new bubbly offers fragrant flavours of summer fruits and is light and refreshing on the palate. As well as being the ideal sophisticated aperitif, the wine is the perfect accompaniment to a range of dishes, from fresh shellfish platters to light and fruity desserts. Whether to toast to good times with friends on an alfresco terrace, or to accompany an evening meal with loved ones, the wine is both a stand-out and stylish way to ‘drink pink’ this summer. Extending its 150 years of unprecedented sparkling wine expertise, the wine is the latest addition to Freixenet’s premium Italian range and follows the introduction of its hugely successful premier Prosecco, launched in May 2017. 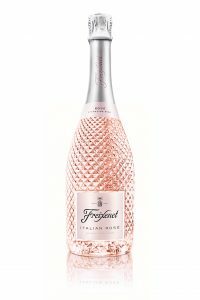 Freixenet Italian rosé will be available to buy in Tesco from the 17th April 2018 – RRP (£12) with other retailers to be announced. The rosé is now also available to be enjoyed at Revolution Bars and Revolution de Cuba.